Benno's Figures Forum • British troops Australia 1800s? Which sets in 1/72 best depicts the English stationed in Australia during the Castle Hill rebellion? 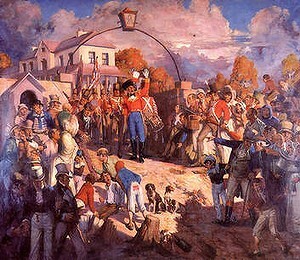 With the exception of Quartermaster Laycock, seen in the left foreground of the painting below, any images of the New South Wales Corps I've seen show the men wearing stovepipe shakoes as in HaT's or Emhars peninsular War British infantry rather than the brimmed round hat. This painting also shows them wearing breeches and gaiters, don't now where you'd find figures like that unless you body swapped them onto French legs, but other images from the slightly later Rum Rebellion show them in trousers without gaiters. With the NSW Corps leaving for Parramatta to deal with the rebellion Sydney was garrisoned by sailors and marines from HMS Calcutta and local militia. HaT's British sailors and Marines would help if you wanted these. In the attack on the rebels the Rum Corps were also joined by civilian militia. Perhaps some figures from HaT's Spanish Guerillas that don't look too Spanish would work. I don't know of any Cavalry from this period. The officer in that last pic is the same Captain Johnstone who led the attack on the rebels at castle hill. I'm thinking perhaps the guys in the top hats. Thanks Graeme, sad that the Peninsular infantry set is out of print, I'm not a fan of Emhar's sculpting so that is ruled out too, at least for now. The sailors set seems interesting though. Seems unfortunate that with all the British sets available none seem to match the NSW corps perfectly, at least as far as I can tell. I've just noticed that the Marines in the HaT set are wearing breeches and gaiters. One company of the NSW Corps was raised from men who were invited to transfer from their predecessors the New South Wales Marine Corps (under the same Captain Johnstone) but I haven't seen evidence that they might have retained their marine uniforms. The Marine figures might just be an option, either as they are or with a head swap. One correction to my previous post. Captain Johnstone was a Major at the time of the Castle Hill Rebellion. a few years later he was Lieutenant Colonel and even Lieutenant Governor of the colony for a short period before his court martial. It was quick up and quick down in those days.